The story of the Speed Force killer, as Flash calls him, begins in #20 and with it begins one of the best story-arcs that I’ve read in the New 52 this year. This is very much a mystery thriller since Barry has to discover who is killing his friends and why. Not to mention, his friends are killed in a rather gruesome manner as well, very, very bloody and just plain nasty. Since I wasn’t reading the series before this issue, I didn’t know any of these characters other than Iris West, and so I wasn’t quite able to connect with their deaths (one dies in this issue, another’s death is hinted at, and a third dies later in one of the other issues). But, re-reading the issues just now, I definitely felt that connection this time. And I definitely felt Barry’s internal drive to find whoever killed them and bring that person to justice. 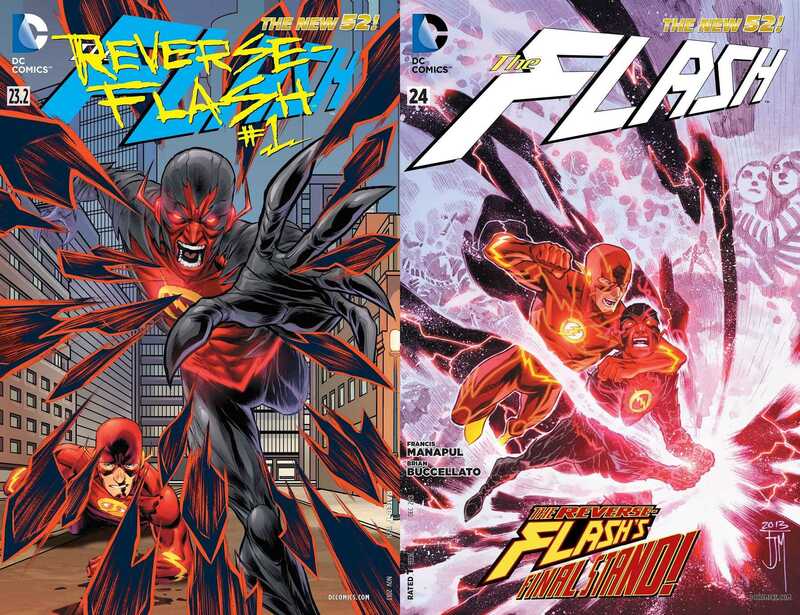 One of the best moments of this arc was all of #21, which featured Kid Flash from Teen Titans. As part of his investigation Barry finds out that the killer wears his symbol, but in reverse. And there is only one person Barry knows of who wears his symbol like that, and its someone that Barry has been meaning to clear things for quite a while now. So this issue is all about these two characters interacting. Just as I expected, Manapul and Buccellato touch on the mystery of Kid Flash’s identity and his nature. He is not who he says he is, exactly, and part of the fun of reading this issue is how the two writers deal with that subplot. The ending of the issue is also pretty great, and it definitely maintained my interest in the characters and the story going on. Barry’s characterisation is definitely one of the other things that drew me to these two issues and kept me going. I’m a huge Wally West fan (animated version) and these two issues gave me a reason to become a Barry fan as well. With these first two issues, what I appreciated most of all was the fantastic art. Manapul and Buccellato handle almost all the art on the series, Manapul usually as the penciller and Buccellato as the colourist. And they do a very incredible job with all of that too. Manapul’s layouts are incredibly creative throughout these two issues, something that is consistent for the rest of the arc as well, and they are one of the reasons why these two issues are so so appealing. And his characters, well they are pretty incredible too. I love how Barry and Iris West are drawn, most particularly. Of course, there’s also the action in these two issues. I’d never imagined that Flash’s powers, and his use of them, whether he is racing around the world or creating a wind-tunnel to prevent a train from crashing, could be made to look so damn cool. And that’s exactly what Manapul does. The pencils for all of Barry’s action are pretty much off the chart, and Buccellato’s colours make each and every single panel stand out significantly. And finally, their Reverse Flash is just amazing, with his red-black look that oozes menace and creep in every appearance. Issues #22 and #23 really kick things into overdrive. With Reverse-Flash continuing on his killing spree, it becomes vital for Barry to look out for Iris. And he does that by giving her a “Flash-suit” that is made out of the same material as his own suit’s. The scenes in which Iris puts on the costume are handled extremely well, both in terms of the dialogue and the art. And I really like the look of her costume. She even gets a visor to protect her eyes, which was really cool I have to say. But we see another character enter the equation as well. Dr. Elias, someone who used to be The Flash’s ally but later become an opponent of sorts, also leaves his mark on this story since he intends to bring him down for being irresponsible towards the Speed Force. And given all the experiments he’s been running, he draws the interest of the Reverse-Flash, setting up a really epic confrontation between the big bad villain and the hero of this story. 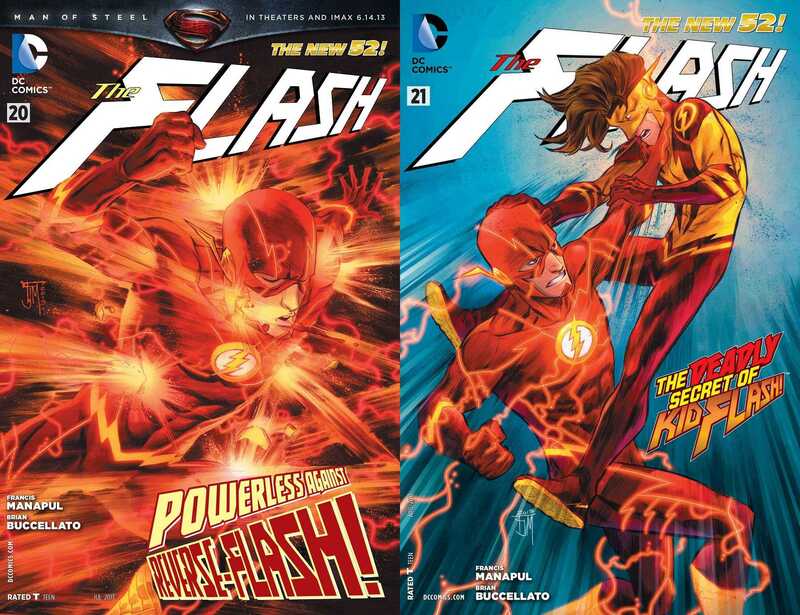 With these two issues, what I loved most was the all the fight scenes between Flash and Reverse-Flash. So much god-awesome action in those scenes, in every single panel, every single page. The throwdown between the two of them is absolutely brutal and they match each other blow-for-blow. Manapul doesn’t shy away from all the ferocity of those scenes, especially given how he lays those scenes out. There are no standard panel layouts here, no straight-up panel boxes one after the other. The way he handles them, in either of the issues, well, they are something to see for yourself. Another great thing about these two issues is the interactions between Barry’s current girlfriend Patty Spivot and Iris, who I believe is a former love interest for Barry from earlier on in the series (can’t confirm since I haven’t read the earlier issues myself). Knowing that they have both been or are Barry’s love interests, the character drama between the two of them is quite subtle, and something to watch. It seems that Patty doesn’t know about Iris but Iris certainly knows, and when they talk about Barry and Patty moving in together, Iris’ reaction is almost heartbreaking. What matters in the end is that since these two issues are at the mid-mark of the arc, they need to be better than the issues that have come before and almost everything needs to be turned up to eleven. And it most certainly is. The first two issues were pretty damn good and yet somehow Manapul and Buccellato manage to raise the stakes again for these two issues and make them even better. Certainly a lot more awesome action in these two issues. Issue #23.2 is one of the three issues that were put out during September’s Villain’s Month initiative and it like those for the rest of the titles released in that month, this one focused on the villain: Reverse-Flash. It gave the origins of the character, and told us how he came to be what he is. The amazing thing about this issue is that as it is written, it is a story that goes back in time. We see events from the character’s perspective at some point in his past, and then we go to a few years back when he is at a different stage of his life. Eventually we go back to the defining moment of this issue, a most unexpected cliffhanger if there ever was one. His name, Reverse-Flash, should be a good enough hint as to why Brian Buccellato and Francis Manapul chose to use this approach for this issue. Instead of Manapul on the art for this issue, we have Scott Hepburn instead. None of the books that were put out for any of the series for Villain’s Month were drawn (in the least) by their usual teams, except for a few exceptions. The Flash #23.1: Reverse-Flash #1 is an issue where a guest artist was brought on-board, and I gotta say that the decision was a good one. Hepburn’s storytelling is very traditional in places with the panel layouts but he goes the extra mile to emulate some of Manapul’s choices as well and the result is pretty damn good. Cascading panels or panels within panels, or lightning panels can all be seen here in this issue. 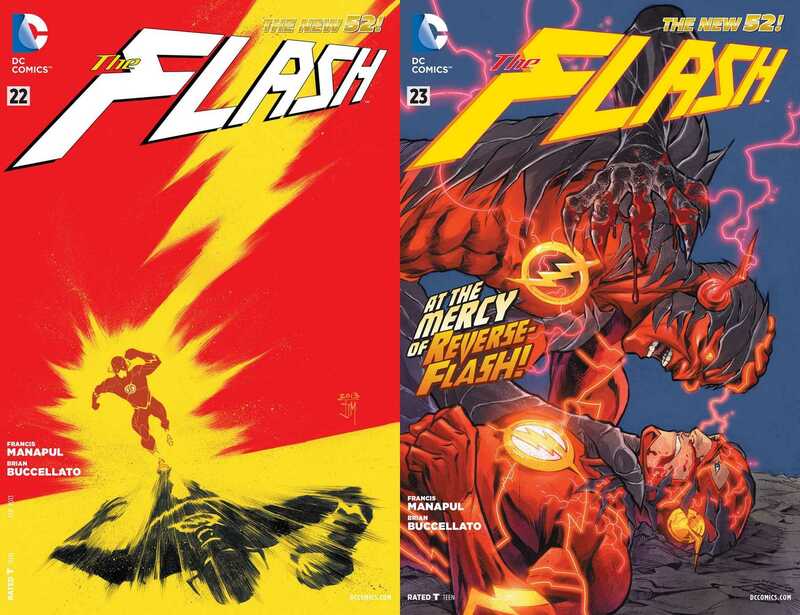 For my money’s worth, all of the three Villain’s Month issues for The Flash were the best in the month. None of the other series put out good issues with this kind of a consistency, and it worked wonders here. Buccellato and Manapul did well to continue their arc from the regular series on this issue, unlike any of the other series for the month, and since I didn’t have to wait an extra month for this story to move forward, I was quite pleased. The writers made this issue a fairly decent stand-alone and also an integral part of the entire Reverse arc. The final issue of the arc, #24, brings things down to an epic conclusion. In issue #23 we finally learned who the Reverse-Flash was, that is, who is the man behind the mask and #23.2 gave us the reasons for how and why he became a supervillain and what his killings of Barry’s friends were all really about. First off, the guy is most definitely a nutcase. Second, I loved the big reveal about him, and how it was handled in the #23. Not to mention, Iris was on her best in that issue and this continued in this issue as well. What it all comes down to is a matter of family and how far you are willing to go to keep them safe and what you can go do to keep their love. For Barry it manifests in wanting to learn who truly killed his mother all those years ago so he can finally exonerate his father. He makes the big decision to tell Patty about it and let’s go of it so that he can move on with his life that he building with her (an interesting narrative decision given that the story arc is called Reverse). For Iris it means continuing to convince her errant brother that he should finally make things up with their estranged father. For Reverse-Flash, it means something else of course. Manapul’s love of creative panel layouts is most exemplary in this issue and one of the reasons why I consider this issue to be one of the absolute best issues of the series, based on what on what I’ve read. Towards the end, in the second-half, he goes for more traditional layouts, but he balances that out by drawing all his characters even better. Which is awesome. And as always, Buccellato’s colours continue to impress. I loved Barry and Patty in this issue and the artists did well in ending the issue as they did. Overall, I have to say that this entire arc was pretty damn awesome, and that I will most definitely be going back to catch-up with the entire series, reading the previous three volumes of the series. I particularly want to read the first volume with the Rogues and the third volume with Gorilla Grodd’s invasion of the Gem Cities. More The Flash: Annual #2, #23.1, #23.3, #25. Posted on December 15, 2013, in Comics Reviews, Review Central and tagged Advent 2013, Advent Calendar, Barry Allen, Brian Buccellato, Comics, Comics Review, DC Comics, Flash, Francis Manapul, Iris West, Kid Flash, New 52, Reverse-Flash, Review, Review Central, Superheroes, Supervillains, The Flash, Villain's Month. Bookmark the permalink. 6 Comments.